Facebook may be developing an official Messenger desktop app for Mac, according to TechCrunch. 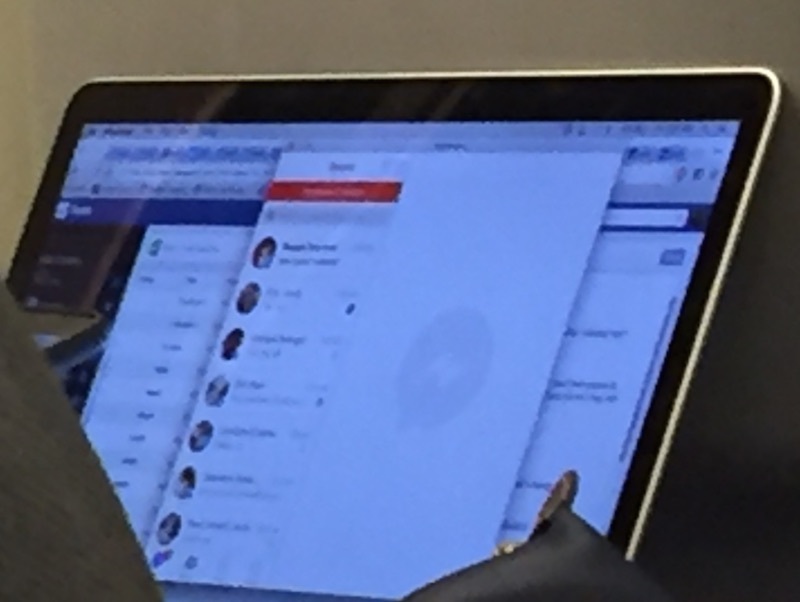 The technology website obtained a blurry photo that allegedly shows a Facebook employee using the Messenger client on Mac, which would be easily accessible from the OS X dock as opposed to a tab in a web browser. Messenger for Mac appears to have a navigation tab bar in the bottom left with options matching the Messenger for iOS mobile app, including Recent, Groups, People and Settings. These menu options are reportedly not found in unofficial Messenger apps, making it more likely the app is not a third-party version. The company's goal is likely to create a standalone Messenger experience on Mac, similar to how it released a dedicated Messenger app for iOS in August 2011. But unlike when Messenger was detached from the main Facebook app on iOS in July 2014, the web version of the chat platform may remain available alongside the desktop app. Facebook released a Messenger desktop app for Windows in March 2012, and said it was "busy working on Messenger for Mac" at the time, but the company discontinued its Windows app two years later and has yet to release a Mac app. Facebook also launched Messenger.com last April as a standalone web chat client. Facebook often internally tests apps that never ship, so it remains unclear when or if Messenger for Mac will be released. A company spokesperson declined to "comment on rumor or speculation," but author Josh Constine said that is "the same boiler plate response" he has received about rumors proven true in the past. This seriously tops the list of terrible apps I never want. Tracking is needed for desktop market isn't it? For mobile market, it's been covered. I feel incomplete if no one is tracking me. For iMacs powered from mains, there will be no complaints of phantom battery drain issue. Development should be easier. I will also leave a glowing 5 star review for weekly update change logs like "We update the app regularly so that we can make it better for you"
Facebook, Thank you very much for this. Will the desktop app also bug you every time you open it to turn on notifications? LOL, I was amazed when I saw that the first time. It could be worse. I've started seeing apps giving me push notifications for no good reason (e.g. "you haven't used this app in a while"). I delete stuff like that immediately. Misusing the APN service should be grounds for banishment from the App Store. Will the desktop app also bug you every time you open it to turn on notifications, or is that "feature" reserved for the mobile app alone? Ugh, it stinks that they started disallowing Jabber clients to connect. Last year, I used to be able to contact all my Facebook friends (aka most people I know) just through Messages, plus people on iMessage, SMS, and AIM. It was perfect! I wish Apple would update Messages to support whatever proprietary protocol Facebook uses because I really don't want to have to run multiple messaging apps. EddiOS42 has the right idea. They probably did it so they can get people to use their own stuff. Unfortunate. The messenger client Goofy is doing pretty great out there. That's why Facebook suddenly stopped working in my Message app for Mac. It's 2016 and I still don't use FB. This could also be an employee wrapping the messenger code into a simple mac app for their own personal use. Doesn't really mean much yet, IMO.